Welcome to Garden Bloggers' Bloom Day for February 2012. Here in my USDA Hardiness Zone 6a garden, I've been enjoying a mild winter. But I've been enjoying it with one eye open, watching for winter, wondering where it is, waiting for it to send us some real snow and cold and wind. Finally after the watching, wondering, and waiting, winter sent us some snow early yesterday morning, leaving flowers like snowdrops covered by about an inch of snow. No worries, though. By mid-day, some of the snow had melted on the south side of the house and by late afternoon, most of the snow had melted completely throughout the garden. We'll be back to our mild winter weather before we know it. Snow is certainly expected in mid-February around here. Looking back at past bloom days, we didn't have snow on the ground in mid-February in 2011, but we did have a big snow and ice storm at the beginning of February that year. We had snow in 2010. We didn't have snow in 2009. We had snow in 2008. And we definitely had snow in 2007, the first year of Garden Bloggers' Bloom Day. Here are some flowers that "lie abed" under "snowy coverlid" in my garden in mid-February. Other blooms braving the cold and snowy coverlid include the witchhazel, Hamamelis vernalis, and the Christmas Rose, Helleborus niger. Inside, the Christmas cactus which bloomed in December has decided to repeat its blooms for February. I'd like to think that it is my green thumb, my careful attention to all of this plant's needs, that has caused it to re-bloom. That is only true if neglect and occasional watering qualify as "careful attention". Sometimes, for some plants, that's all it takes. And that's February in my garden. What’s blooming in your garden on this mid-February day? We would love to have you join in for Garden Bloggers’ Bloom Day and tell us. It’s easy to participate and all are invited. Just post on your blog about what is blooming in your garden on the 15th of the month and leave a comment to tell us what you have waiting for us to see so we can pay you a virtual visit. Then put your name and the url to your post on the Mr. Linky widget below to make it easy to find you. Love all the little peek-a-boo blooms in the snow. Need to go to sleep now that I've posted! We are growing snow too! Yes, we've had a very odd winter ourselves here in CA. Hardly any rain in the rainy season is not great. But that's no reason not to enjoy the flowers anyway. 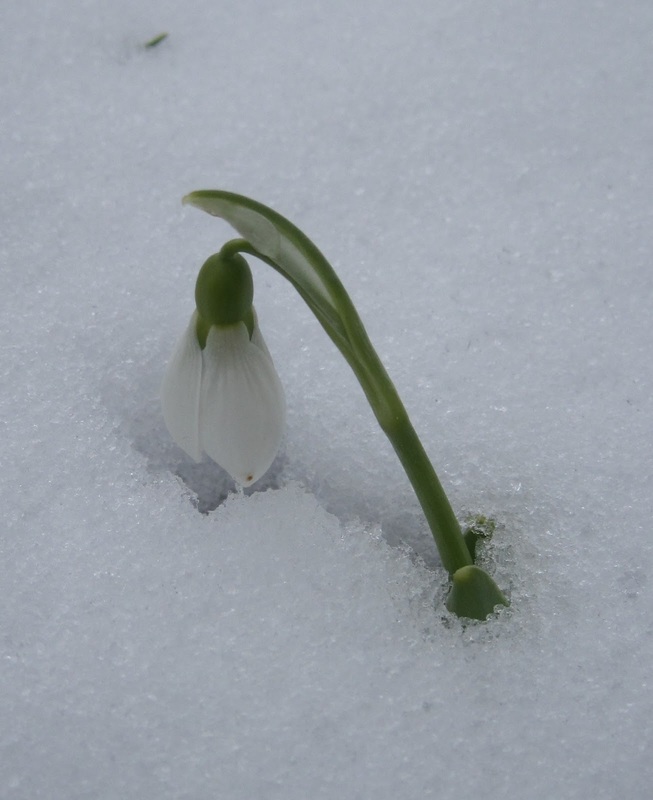 Love your little snowdrop. Happy bloom day! All our snow has disappeared again. I would be very happy if that’s all the snow for this winter, but it is a bit too soon to say. I have several plants flowering at any time in my garden, even in December and January; in fact, I have fewer plants in flower in August than any month of the year. Not long to go for the daffodils now! We have no snow or snowdrops. The great delight of garden blogs is that we can enjoy plants we can never hope to grow ourselves. In a sense, garden blogs make our own garden stretch across the entire world. Happy Bloom Day to all! Lovely signs of spring emerging from the snow. It has been an unusually mild winter here in the northeast and soon there will be more blooms on the way! Happy GBBD to everyone! I strongly echo Hoover Bo's comments, and in my case most especially for the snowdrops, which are my favorite. The only problem is we cannot grow it in the hot tropics! Nice to see your blooms through the snow. You got more than us this year. We've had nothing much other than dustings. Alas no snow here despite us being prepared this year with snow tyres. A very mild January fooled my plants and winter finally arrived in Feb here in Scotland. Snow continues to elude us in our little corner, but bitter temperatures and frozen water don't stop a surprising amount of flowers still raising their heads this month. Lovely crocuses in their blanket of snow. It's still nice seeing some colors popping out under the snow. Thanks for hosting. It seems like many a mild Winters this year. I've included in this month's BBD snapdragons that are beginning to flower - quite strange for this time of year! Northern Ireland generally gets mild Winters but I think milder than usual this year. P.S. 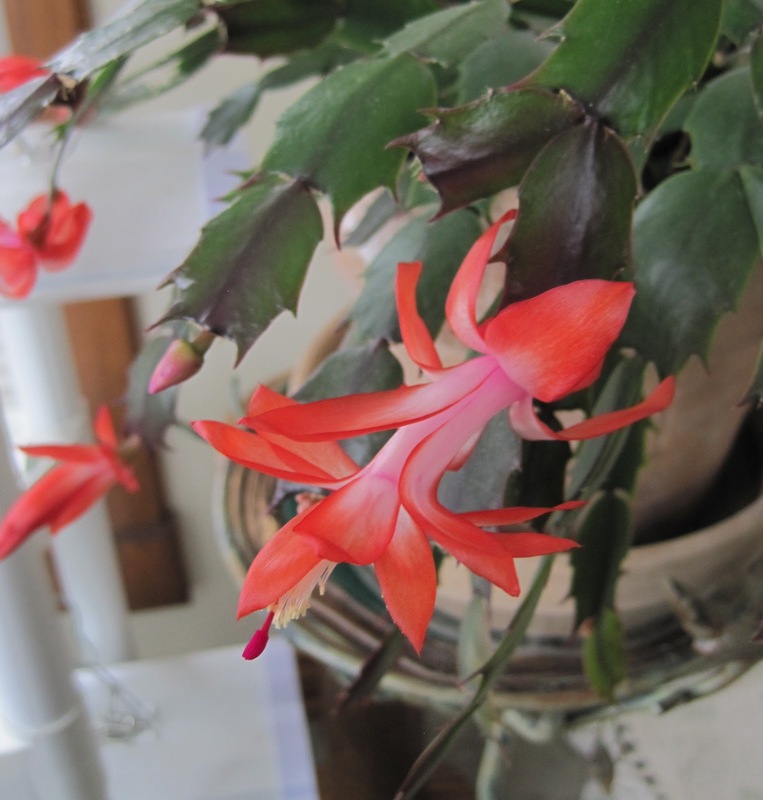 Aren't Christmas cactus great; mine didn't flower in Dec but is flowering now. All the best, Kelli. It's just amazing to me to see those delicate blooms peeping out of the snow. Thanks so much for hosting another great GBBD. The wonderful thing about crocus - they don't seem to mind the snow at all! Here in the southern U.S. its daffodil season. Great to get a second bloom season from the Christmas Cactus! Hi Carol - until a couple of days ago I would have been posting pictures very similar to yours. But the snow has melted and the flowers have perked up no end, enabling me to ponders gifts from my friends. It looks like we are having similar weather and similar blooms. Happy GBBD. We had an arctic chill come through at the weekend which put an end to many of our early blooms. Back up we go to normal temps. Thank goodness since I can only take cold for so long! It is nice to see your blooms braving the snow! Brrrrr......I can almost feel the chill looking at your photos and I am down here bitching about the hot sun. Some of your snow blew this way as well. Fortunately it was gone by mid morning and no real garden damage occured. Thank you for hosting another Garden Bloggers Bloom Day. I don't have any spring bulbs blooming yet...wondering about all those snowdrops I planted last fall...where are they? True to form, it is a bit colder and more snowy here in PA. My snowdrops have been buried for a week, which is the longest stretch of snow we have had yet, so I cannot complain. But 38 F and rain is expected for tomorrow. Winter has been a little bit of a let-down in Maryland. Some people are still holding out, but I'm already ready to call it a loss and move on to spring! Wow Carol - blooms already! Here in 5b we have some snowdrop and daffodil foliage emerging, but no buds or blooms yet. Our Thanksgiving cactus has new buds, but no re-blooming yet. The buds seem to reach a certain stage and then fall off. 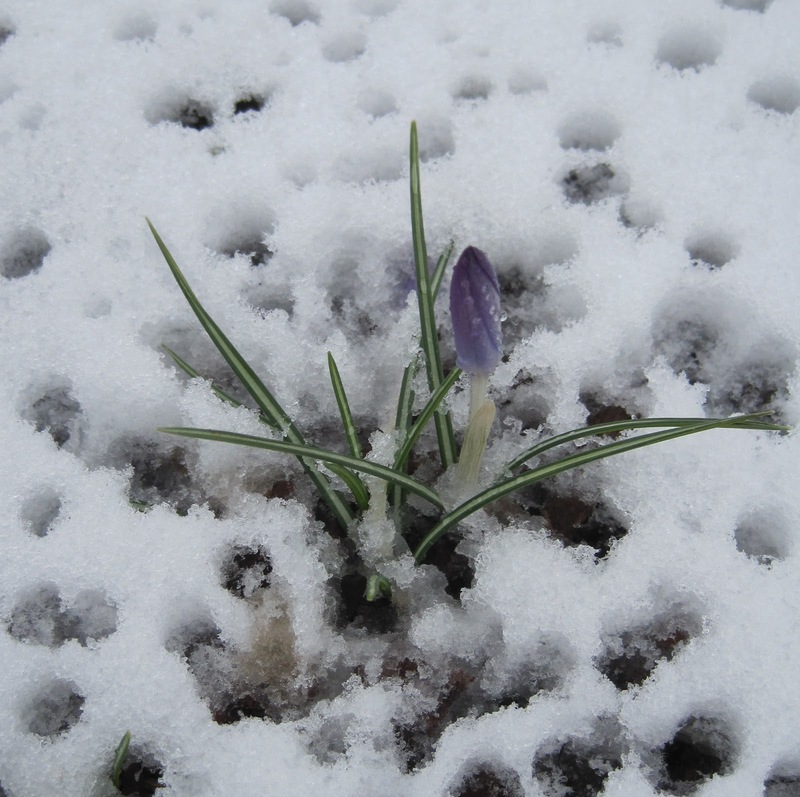 Ah, the first signs that spring is on the way with bulbs peaking through the snow. I remember it well! Crocuses in the snow are lovely! Thanks for hosting! This is the second time I've done GBBD, but I think I messed up the comment the first time and it didn't go. Sorry about that. Anyway, thanks a lot for Garden Blogger's Bloom Day. It's great to get the inspiration to go out and see what's there, and the record of what's been blooming in so many other gardens is fun to look at and also useful for planning next year's garden! Aw, sweet little crocuses in the snow. My crocuses are slow in coming up this year. Only foliage so far. But I do have blooms to share - thanks to the mild winter we've been having. Thanks for hosting. Our Chicagoland garden is ahead of schedule this year. My winter aconite is blooming nicely. 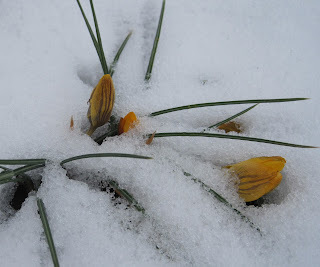 Love, love, LOVE the crocus under the snow! It has been a very mild winter down here in Austin as well. The trees are all beginning to leaf out already! Mild winter here, too, not as mild as yours. We do have a bit of snow cover and another small storm coming tonight. But nothing even peeking up outdoors yet. I'm hoping to see a snowdrop next month. Hope you are doing well. See you soon. I'm beginning to wonder if we'll see winter at all this year in Southeast Tennessee. It was 'supposed' to snow this week, and I didn't even have frost on my windshield on my way to work the next morning -- not that I'm complaining. Scraping ice off my windshield is not my favorite early morning task. Happy Bloom Day to all from the left coast.. I think a bit of snow is the perfect foil for those minor bulbs. It makes the colors stand out vibrantly (well, except for the snowdrops, but they do need a bit of snow to live up to their name). Happy Bloom Day, and thanks for hosting! It looks really cold there! Good to know that these blooms are growing even it is winter. Nice post! I love the comparison from one year to the next. Garden Bloggers Bloom Day is often missed in my garden...but will post one this month. Thanks for hosting this! All your bulbs look cute peeking out of the snow. In my post, you will find photos of the new hybrid hellebores I will offering this spring because they are all in bloom now. Thank you for hosting GBBD. I've been reading your wonderful garden blog and this is the first time I join GBBD. Happy GBBD! Nice to see all your brave little blooms peeking out from the snow. I think my crocuses went back into hiding after this past cold spell, but I'm not going to complain about this mild winter at all. Thanks for hosting another great Bloom Day, Carol! Really struggled to find much in flower this month, but it was worth it in the end. Thanks for hosting. We have a nice light (4-5 inches) covering of snow, but it's getting warmer again today. I'm glad I covered a few things so they can withstand this whipsaw weather! Your pictures give me hope, as do my post for gbbd--bouquets from the past. I'm jealous! I wish we had things blooming outside! My daffodils have buds but the recent cold slowed them down significantly. No snow here in Portland (thank god), and no snow-drops. I must say that the snow makes a most attractive much around your plants in these photos. Happy start to year number 6! There is pretty much only one thing blooming, but it is a stunner--Hellebore "golden sunrise", so enjoy! I love the snowy scenes from your garden and I especially love that little snowdrop. Happy Bloom Day to all! Thanks for hosting Bloom Day! I love seeing what’s blooming around the world! No snow for us, but we are receiving some much needed rain today. I love that word "coverlid" from the poem! Happy Bloom Day! I have a just single hellebore blooming but it is lovely. Happy bloom day! Can't believe those tiny flowers push themselves through the snow. What troopers! Very mild and disappointing Winter we're having here says this snow-loving gal! A dusting, if that, now and again, but it doesn't stick around more than a few hours. Happy GBBD from NJ Zones 7a & 6b! Oh, I miss snow...Last year, we had three really nice snows. The beauty of living in SC is--everything shuts down when it snows, and then the snow disappears within a few hours. This year, I have very disappointed children! 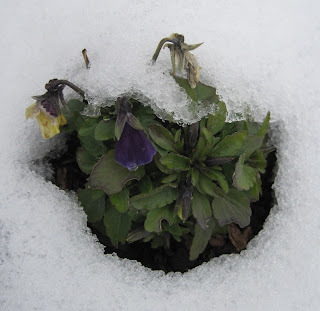 Love the photos of your blooms peeking through the snow! Thanks for hosting bloom day! What a lovely winter lullaby. The season finally caught up with us last week but with ice not snow. Thanks as always for hosting. The new trend here is mild weather until a couple days before Bloom Day, then a freeze. Fortunately the plants know how to handle it by saving back tight buds for a rapid recovery of beauty. Thank you for having us this Bloom Day. I love it that crocuses are starting to show bud color in Indianapolis. Mine aren't even doing that, yet my Tet a Tet daffodils are showing bud color and I have my pieris starting to show blooms. i have to say i'm a little envious of your snow, though i'm mostly a warm weather gal. it does look pretty, though. how nice to get a repeat bloom on your cactus! love the color on that one. happy bloom day, carol! No snow this year for our corner of upstate New York. But now I know what frost heaving looks like. I haven't visited in a while - I've missed you all! Glad to be back for bloom day. Snowdrops pushing through snow...the strength of bulbs is so amazing! And beautiful color on the cactus. I fear the snow you had will hit us on the East Coast/Mid-Atlantic this weekend. Ah well, like you, had a mild-ish winter so far and cannot really complain. Happy GBBD to you all! It's always shocking to finish a post then hop over to your page and find snow! I've been out of the blogging scene for a bit, but it feels good to be back! Loved your post! Well, in my upstate NY garden, I missed snow by three days. None of my bulbs are blooming, but my daffodils have been poking themselves up for over a month now. One of my lilacs is trying to leaf out. But as far as the flowers, it is only a couple of indoor African Violets for this month. I also have a reblooming Christmas Cactus, but it is only budding right now. Can't believe how snowless this winter has been! I have the same reblooming Christmas cactus phenomenon as you have. My outdoor shrubs are happy it's been drier and somewhat warmer! Very nice to see you with late winter blooms, and that winter didn't wallop you in central Indiana. The purple crocus...divine. Your post reminds me how I must find ways to design crocuses and bulbs into desert grassland contexts, somehow! Those precious snowdrops in the snow! Love that pic! My old garden has crocuses and snowdrops blooming, too, but I had to contrive and connive to make it happen. I got a little teary eyed looking at old pictures of my old garden tonight. I hope I can do as well in the new one. I have produced another daffodil for the record books. Thanks for hosting! I pretty much just have crocuses, but the daffodils are chomping at the bit! 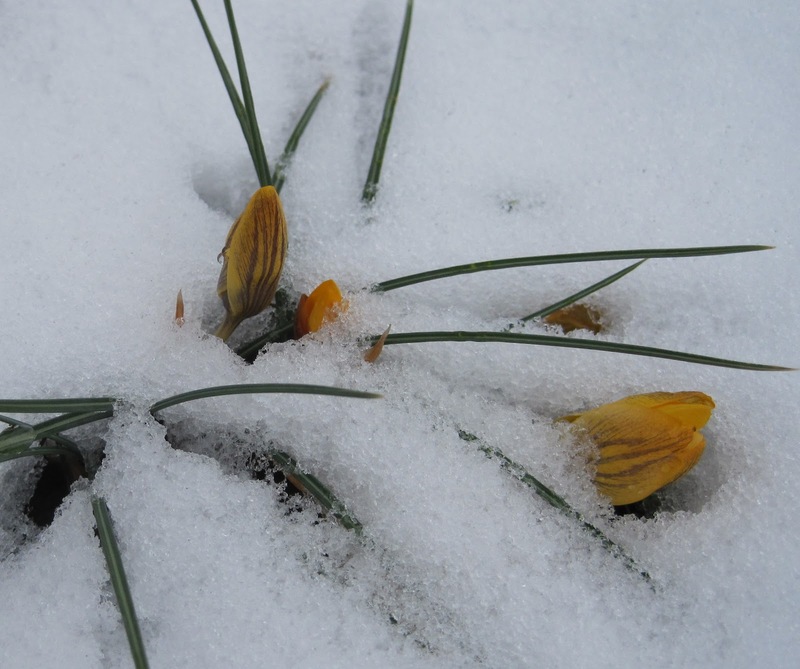 These images are so inspiring, flowers in the snow. They are a symbol for some kind of resilience I need very much right now to tend to my garden. Thank you! Snowy seems so right for February in Indiana or Illinois, Carol. Maybe not a blizzard but at least enough to cover the ground for Valentine's day & GBBD. Enjoy the crocuses and snowdrops once they defrost. It's too late to wish for snow here in Austin - everything is leafing out! Really enjoyed the snow crocuses! Hate your word approval system it is very hard to read, please make it simpler. Nature is so determined! Love your flowers peeking out of snow. In central Texas, we've had no snow but we have had rain and I have some blooms to report. We've had a mild winter here too. I've really enjoyed the flowers! Your little blooms are valiant in the snow. I can hardly wait for spring this year... We had some clear 55*F days in January that will probably set up some plants for early spring, I hope the weather will play nice. How lovely to get a second bloom on your Christmas cactus! Snowdrops look even prettier to me when blooming in the snow. I'd be thrilled to find an outside bloom this time of year, even if they were surrounded by a little snow. My first time to participate in GBBD in almost two years although I have continued to read May Dreams Gardens.